Heavy duty power connectors are used when extra protection is needed against dirt, mechanical stress and moisture. They enhance the secure and speedy assembly of machinery, in some instances permitting power supply into a single connector. A wide range of heavy duty power connectors is available, from cable configurators to kitting services. 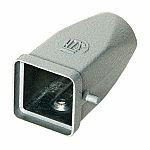 A heavy duty power connector is constructed with a connector insert and a protective housing made of die-cast aluminium. The insert is responsible for electrical functioning and the strong enclosure is resistant to frost and vibrations. What are heavy duty power connectors made of? Heavy duty power connector inserts allow the secure transmission of high voltages in a small space through their high quality insulation materials. A single type of plastic is used. Their aluminium protective enclosure is corrosion resistant, and their stainless steel clips make them waterproof and dustproof. Because of their robust housing, they can be used in very harsh environmental conditions.